Westerham Hill is the modern name for the locality formerly known as South Street, but additionally taking in Hawley’s Corner. The hamlet’s original name dated from the 18th century and referred to its position south of Biggin Hill on the road to Westerham. That road (now the A233) is called Westerham Hill for a short stretch to the south of this locality (right at the bottom of the map below). Like other villages hereabouts, South Street’s principal crop was straw­berries, grown on a dozen farms and sold at Covent Garden. The other crops were eques­trian; South Street staged an annual horse show and its stud farm bred blood­stock. South Street’s name seems to have fallen out of favour because it was overly generic and it became Westerham Hill in the early 1920s. Some maps, including Google’s, still show the South Street name. Over the course of the 20th century, changes in land use caused a decline in the demand for agricul­tural labour and consequent rural depop­u­lation. The village post office and shops have gone but the local pub remains, catering to a wide catchment area. Formerly called the Fox and Hounds, it was renamed the Aperfield Inn in 2012, probably to avoid confusion with a pub on Toys Hill, on the south side of Westerham beyond the Greater London boundary. Hidden London approves of the inn’s new identity, which revives an old manorial name. South Street Baptist chapel was founded in 1887, but succumbed to ‘Westerhamisation’ and changed its name after the Second World War. The chapel’s history provides some indic­ation of the ups and downs of the community. It had to be rebuilt in 1911 to accom­modate a growing congreg­ation and the old building was converted into a schoolroom. 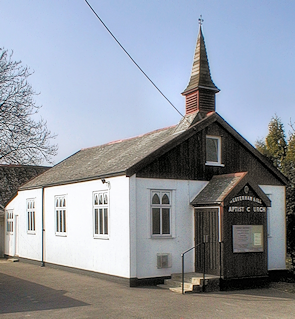 It became a church in 1932 and a church hall was added in 1960. Thereafter, attendance began a steady decline. Some high-class housing has been built in recent decades, endowed with extensive grounds. One property with an indoor swimming pool complex went on the market for £1.8 million in 2006. Main Road has a variety of rural small businesses, including boarding kennels, pest control, and the Saddlery and Gun Room, a country pursuits supplier.